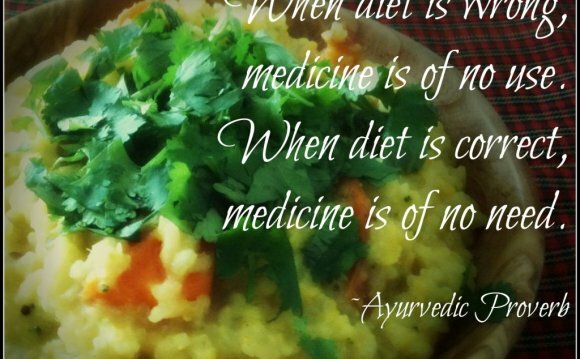 In Ayurveda, health is much more than the absence of disease. It is the dynamic integration of the body, mind, spirit, and environment. Herbal medicine offers a gentle approach to enhance this integration and correct subtle imbalances. For Vatas, herbal remedies can be especially helpful for improving digestion, elimination, and sleep. They can also help restore immune function, calm an anxious mind, and promote detoxification and renewal. Keep in mind that Ayurveda does not support herbal allopathy, in which you take an herb to relieve symptoms without looking for the cause of the underlying imbalance. Herbs need to be used as part of a complete plan for mind-body balance. Instead of simply prescribing valerian to improve your sleep, an Ayurvedic doctor would help you explore the underlying issues that are keeping you awake. With this Ayurvedic perspective in mind, let’s look at a few herbs that are particularly balancing for your predominant dosha, Vata. Composed of space and air, Vata dosha is responsible for all movement within your physiology. When Vata becomes aggravated or excessive, you may experience anxiety, insomnia, palpitations, and digestive issues, among other symptoms. You can use grounding and calming herbs as part of an overall Vata-balancing lifestyle. In Ayurvedic medicine, ashwagandha has been valued since ancient times as a Rasayana or rejuvenating herb that helps the body cope with physical and emotional stress. In Sanskrit ashwagandha means “the smell of a horse, ” indicating that the herb imparts the vigor and strength of a stallion. It is traditionally prescribed to help people strengthen their immune system after an illness. In fact, it’s frequently referred to as “Indian ginseng” because of its rejuvenating properties (although botanically, ginseng and ashwagandha are unrelated). Ashwagandha is particularly beneficial for Vata types as it calms the nervous system and helps focus the mind. It is frequently prescribed for people who complain of fatigue, have difficulty concentrating, or feel “ungrounded”—all symptoms of Vata imbalance. Ashwagandha contains many useful medicinal chemicals, including withanolides, (steroidal lactones), alkaloids, choline, fatty acids, amino acids, and a variety of sugars. While the leaves and fruit have valuable therapeutic properties, the root of the ashwagandha plant is the part most commonly used in Western herbal remedies. The usual recommended dose is 600 to 1000 mg twice daily. For people who suffer from insomnia and anxiety, having a cup of hot milk that contains a teaspoon of powdered ashwagandha before bedtime is beneficial. In extremely large doses, ashwagandha has reportedly induced abortions in animals. Although no similar studies have been carried out on humans, women should avoid the herb during pregnancy. From an Ayurvedic perspective, ginger’s heating qualities make it useful for treating Vata imbalances. For example, people with cold hands and feet can drink ginger tea or chew on fresh or candied ginger to bring heat into the system and improve circulation. Ginger is also a beneficial treatment for common Vata digestive issues as it improves all three phases of gastrointestinal function (digestion, absorption, and elimination). Pulse diagnosis is a technique used in traditional medicines such as in Ayurveda, Indian medicine.